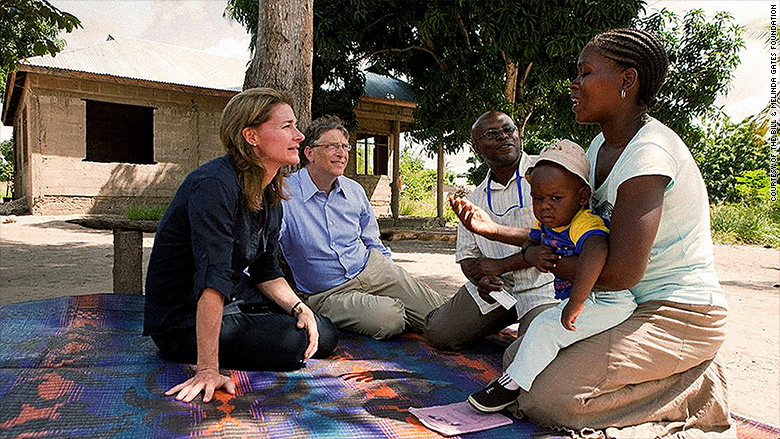 Bill and Melinda Gates want to keep foreign aid flowing from Washington. But with a president that believes in "America First," they're fighting an uphill battle. That's led the billionaire Microsoft (MSFT) founder and his wife, who together lead the world's largest private charitable foundation, to Capitol Hill quite a bit these days. 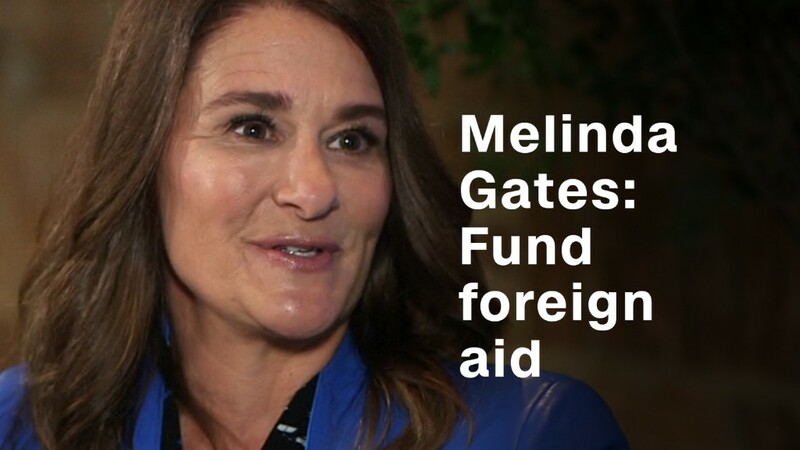 And they're speaking with "everybody" -- both the White House and members of Congress -- about the importance of foreign aid, Melinda Gates said in an interview with CNN's Poppy Harlow. The conversations are taking place as the Trump administration proposes cutting funding for the State Department and foreign aid by 29% next year. It's Congress, though, that will approve the final budget agreement. "These things have good bipartisan support," Gates said. "It's our job, as a foundation with our many, many partners ... to remind Congress that those investments make an enormous difference in the world." Gates said that she "definitely" shares her husband's concerns about the "America First" rhetoric coming from the Trump administration. "We are a global country," she said. "We aren't just 'America as an island' anymore. Look at diseases as they cross borders, like Ebola. We are a global community -- and we need to talk about being a global community." Right now, the U.S. is the largest donor by dollars to overseas development. Without foreign aid, the world wouldn't be able to point to success stories like South Korea, said Gates, who co-chairs the Bill & Melinda Gates Foundation with her husband. "[South Korea] used to be a low-income country. They're middle-income now," she said. "They actually give aid to the rest of the world. We put them on that path." The Gates Foundation released its first ever report that tracks the progress of 18 of the United Nation's Sustainable Development Goals in September. The report, called Goalkeepers, looks specifically at issues such as maternal and child mortality rates, sanitation and financial services for the poor. The intention of the report is to show that improvement is attainable -- but only if funding and efforts to support such initiatives continue. The "report comes out at a time when there is more doubt than usual about the world's commitment to development," the couple writes in the report's introduction. That's why, they explain, it's important to share "promising solutions" and show that investments in fighting severe poverty and global health concerns have a real impact. Gates points to the fight against HIV/AIDS as a global crisis that has seen significant improvement due to such regular investments. "If it wasn't for these investments, ... we wouldn't see this tidal wave that came of HIV being brought down so substantially," she said. The foundation notes in its report that funding to fight HIV/AIDS is now flat, and "there's talk of cuts." That's a problem, they contend. A 10% annual cut in donor funding for HIV treatment could cause an additional 5.6 million people over the current projection to die, according to an estimate calculated by the Institute for Health Metrics and Evaluation that's cited in the analysis. "We have to continue those investments because if we don't, those things could come back and be on the rise," Gates said. The foundation plans to release the Goalkeepers report every year through 2030. 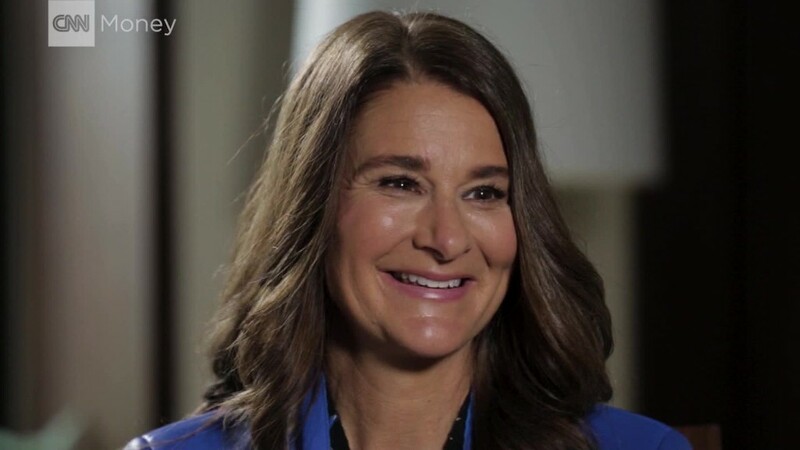 "We realized if we want to make progress against these goals, we have to track and report on the data, because that is what makes things change," Melinda Gates told CNN. "Progress isn't inevitable." The Gates Foundation teamed up with President Barack Obama, Canadian Prime Minister Justin Trudeau and Nobel Prize winner Malala Yousafzai in September for an event to promote the Goalkeepers report and the fight against global poverty. Additional collaboration between Bill and Melinda Gates and Barack and Michelle Obama could be on the horizon. "President Obama ... wants to bring up young leaders. Leaders of the future who are part of making change for the world. So you can expect that we're going to work with him on that," Gates told Harlow.